If you have been following my blog for a while, you know that I have been a big fan of Apple's Pages. I absolutely love the iCloud integration that automatically syncs everything between devices, and automatically stores everything in the cloud. Saving my work became anachronistic.I no longer, reflexively hit Command + S out of fear of catastrophic loss. The Pages workflow, especially when working on a single document across two or more devices, is second to none. Unfortunately, Apple has been tinkering with Pages to the point where I have had to search for alternatives. There are other reasons to search for an alternative. As a writer of a certain age, I need the features of a full word processor. Pages is mostly adequate for that. But when publishing for the web, word processors need to be even more sophisticated. Html is the language of the web. It is not the language of word processors. Therefore, when you write a well-formatted document in a word processor, You are creating double work for yourself. By the time you get that document onto the web, you will have lost all of that formatting work you put into the document. A web writer needs a word processor that does all the WYSIWYG formatting goodness we have come to expect, that can also translate that document into something the web can handle. Most word processors simply can't do that. To avoid doing double work, many writers are forced to use simple text editors in conjunction with something called “markdown”. Markdown is a simplified way of formatting text for easy conversion to html. By learning and using this language, writers can write once, and have their publishing client do the conversion. I find this workaround to be suboptimal. But that is where we are. I think we can do better. So do the people who brought us UX Write. 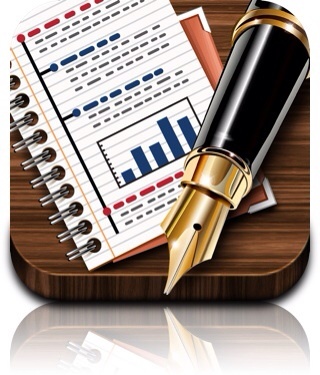 UX write combines the three features needed by an iPad writer into a single app. Our first need is the ability to write and process words. Text editors don't cut it. Words need to be processed. We have to be able to format. We need bullet lists, heading options, color choices, block quotes, fonts, hyperlinks, bold, italics, underlines, superscripts, you name it. We need it. Furthermore, we want to see what it looks like as we do it, not have to wait till we switch to a special viewing mode. At the same time, when we paste what we have written into our web publisher of choice, in this case, Squarespace, we want it to be automatically converted into something that the web can understand. We don't want to have to go back through and redefine our block quotes, and other formatting that didn't survive the trip. That is the kind of double work that makes writing for the web, a real headache. Traditional word processors were not coded for web writers. Text editors were not coded for fancy word processing. UX Writer was coded for both. Now, you don't have to choose. UX Write allows you to create a document in html, or docx. If you choose to write in html, the choice for web writers, and decide you also want to share the document with someone using a traditional word processor, you can instantly convert the document to the docx format. If that person happens to be using Apple's Pages, (a fine choice) you will be happy to know that the docx file is perfectly accessible. When writing with UX Write, you never have to see the code. You do not have to learn the language of html or markdown. All you have to do is write just as you would in a traditional word processor. The software takes care of the rest. But there is a third component to UX Write that is specific to iPad writers who use a bluetooth keyboard for tactile, old school touch typing. In the iPad univers, you are slightly penalized for using an external keyboard. You are cheated out of the auto-correction goodness that is afforded glass typists. It is unfair and unnecessary, and I think Apple will address it this year. However, until that time comes, UX Write has worked around the issue. This is the only app I know of that allows you to use a bluetooth keyboard, and still have your work auto-corrected. That feature, alone, is worth the price of admission. To get this feature, you have to accept some compromises. UX Write bypasses Apple's autocorrection and dictionary, replacing it with a custom solution. A long-press does not give you options for dictionary look-up and speak selected text. Both of these are extremely useful tools for writers. I find their absence to be a thorn in the side. They do, however, manage to use Apple's language support. Frankly, I am not sure how they are able to get away with such a departure from Apple's standard dictionary. That is the kind of alteration that I would expect to cause an app to be pulled from the store. However, this app has been in the store for quite some time. Perhaps it has flown under the radar and just hasn't been caught. There has to be some reason why others aren't doing it. I mention this because of one of the few drawbacks to the app, that being the price. At $25, it is one of the most expensive apps in the App Store for this category. It is not chump change. It is a serious investment for serious, iPad writers. For everyone else, Apple's Pages is free. There are plenty of decent text editors out there that a lot of serious writers are very happy to use, and for a lot less money. If the things I have outlined in this review do not make a lot of sense to you, then this is definitely not the app for you. Over a year ago, this app was selling for $15. That feels like the right price for this app. However, it seems to be the only one that does what it does. Even that gives me pause. If others aren't doing the auto-correct trick, there has to be a reason. Developers who try to fix what they think is a fundamental flaw in how iOS operates, tend to be the ones wondering why their app was suddenly banned from the App Store without explanation from Apple. This feels like the kind of workaround that flies under the radar for a while, but eventually gets caught. That said, that workaround is what attracted me to the app, and is why I risked the $25 for the app. The correction algorithm does not seem to be as good as Apple's, but it works. And I will continue to use it. My recommendation of this app comes with a lot of asterisks. At $25, you have to be absolutely certain that these are the features you are looking for. If you do not do a lot of long-form writing for the web, there are plenty of less expensive alternatives. If the lack of auto-correct when using a bluetooth keyboard does not bother you, then this app may lack a killer feature that justifies the price. As much as I am enjoying this application, I am hoping for frequent updates: a reasonable expectation for the price paid. I also will be happy to update this post if the dev would like to correct anything I've said. It is not a no brainer. But it may just be the right tool for a writer's job. After chatting with the developer, I have decided to upgrade my recommendation with fewer reservations. It is still a serious writing tool for serious writers, or for not so serious writers who need to publish to the web. However, The developer does not appear to be running afoul of any known, Apple policy that would get his app pulled. It seems there is no good reason other developers couldn't do the same sort of thing, and he should get credit for actually providing this much needed functionality. Also, though I can't talk about the devoloper's roadmap for the product, let me just say that the future looks bright, indeed. The price of the app should not be a barrier. For what the app is, as well as what it is becoming, $24.99 is well worth it.